Apple’s touch-based devices have changed the way we interact with computers entirely, but that hasn’t stopped users from occasionally thinking wistfully of the days when physical keyboards ruled the roost. 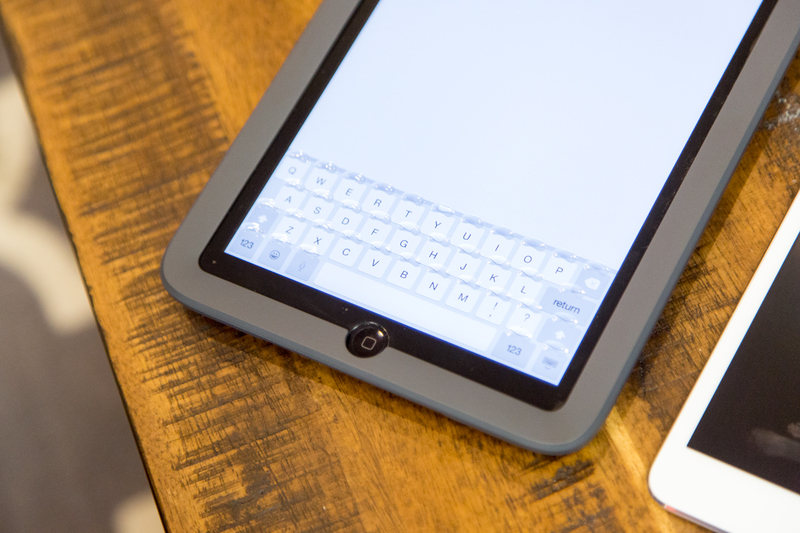 Tactus has taken that desire to heart, and the startup’s first consumer product, the Phorm, is about to bring a tactile experience back to your iPad mini’s software keyboard. Tactus co-founders Dr. Craig Ciesla and Dr. Micah Yairi have been working on technology that can generate physical keys from a flat surface on demand, giving you a smooth, unbroken surface for general touch-based interaction, and a physical keyboard when you need one. The company’s innovation uses a microfluidic panel to achieve its magic, routing liquid through invisible channels to expand specific areas of the top layer of a touch panel, producing protrusions and bumps where previously there were none. Phorm is the first product from Tactus that is ready for the consumer market, and it’s available for pre-order now, with a target launch date of summer 2015 for the first crop of batch of devices. The Phorm is an iPad mini case that incorporates Tactus’ tech into a thin front panel, similar both in size and in method of application to a standard screen protector. It’s paper-thin, and it offers virtually no change in the optics of your display when you look at an iPad inside the Phorm. The Phorm itself also doesn’t add that much additional size to the iPad mini’s sleek frame, adding about as much bulk as you might expect from a fairly durable protective case. The Phorm case itself holds the fluids needed for the transformation it enables, as well as the circuitry required for triggering the key generation. There’s a single large switch on the back that lets you turn the tactile keys on and off, and the case’s industrial design was handled by Ammunition, the same firm that originally worked with Beats on its hardware pre-Apple acquisition. Style is great, but Phorm’s killer feature is the keys that rise up from nothing. These aren’t mechanical keys, of course: They’re essentially touch-capable ridges that suggest the location of the device’s keyboard (in portrait orientation) and have a little bit of give on finger press. But they provide a lot more presence than a flat display for typing by touch alone, and of course they disappear completely when not in use. Essentially, thanks to Phorm’s pricing, you’re getting a major feature in addition to a standard scratch protector, along with a durable protective case, without much cost over and above other cases from premium accessory makers. Phorm is just a start for Tactus – they’re already working on designs for the iPhone 6 Plus and iPad Air, and they’ve even produced a prototype using a generic Android tablet reference design that incorporates their tactile keys right into the display of the device, without requiring any additional parts or user installation. This is a tech that is still in its relative infancy, but seeing it start to make its way out to consumers makes it easy to get excited about where it could progress. The retail price of the Phorm will be $149 once it becomes widely available, but pre-order customers can save $50 through the campaign, dropping the launch price to $99.